One day Usain Bolt is going to do something that a normal human being might do. He'll spill his tea, or drop his chicken nuggets, or trip over his shoelaces. One day. For now, he astonishes and astounds with everything he does. Maurice Greene, a former 100m world champion and world record holder, summed it up beautifully: "The Earth stopped for a second, and he went to Mars." Almost exactly 73 years ago in this Olympiastadion, Jesse Owens produced an athletic performance that made sporting history. Before Sunday night, it seemed impossible that anyone could ever match those deeds. That was before 9.58 seconds. That was before Usain landed. Sometimes with moments like this it's the small details that can be the most revealing. Tyson Gay ran 9.71 secs and was nowhere. Well, second. That's the fastest an American has ever run, a time that would have won every other world championship there's been by a massive margin. 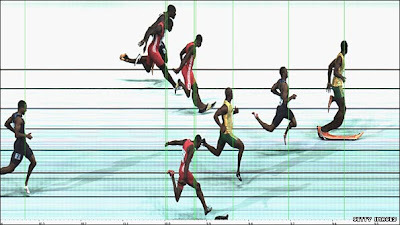 Bolt wins races by the sort of distance that would be considered a spanking in a 400m contest. He behaves in a manner that the sport has never seen before, and then runs times that no-one believed they would ever see. Greene reckoned he might one day see a low 9.6 but never a 9.5. His predecessor as the fastest man in history, Donovan Bailey, thought the same. When Bolt ran 9.69 secs last summer in Beijing, even that seemed an impossible time. To take another 11 hundredths of a second off that defies logic, history and everyone else's biology. The world record has never before been broken by a margin that big, not in the modern era of computerised timing. Five men have never before run under 9.93 seconds in the same race. The greatest 100m in history? Surely. The greatest sprinter ever? Unquestionably. Standing on the start-line, Bolt seemed to know what was coming. As Gay twitched and jumped and sweated alongside him, dwarfed both physically and emotionally, Bolt pretended to play some imaginary drums. When the television camera arrived in front on him he winked. "I'm ready," he yelled. "Are you ready? Let's go!" Every man, woman and child in the place was already on their feet. Portentous music boomed over the masive stadium speakers. My hands were shaking and my legs jiggling, yet somehow Bolt was laughing and horsing around. Crouched on the blocks in his yellow vest and long green shorts, the smile finally slid off his face. A bang, an explosion of long limbs and a handful of flashing footfalls later, it was back and bigger than ever. There was pandemonium. All anyone could look at were Bolt's dancing orange spikes and the bright yellow numbers on the scoreboards all round the track: 9.58. People swore. Some clutched their heads. Others looked at their neighbours with open mouths and gaped like goldfish. It took a while for anyone to ask who came second, or who came third. No-one could remember, transfixed by the image of Bolt glancing left as he crossed the line, searching for his time, and then beating his chest with wild tribal celebrations. Up in the BBC commentary box, Michael Johnson, the last sprinter before Bolt to create the kinds of waves we are seeing now, struggled to get his jaw working. "We've never seen anything like him, and I'm not sure we'll ever see anything like him again," he said finally. "It's truly unbelievable what he can do. I think about the people who have to run against him, and I'm glad I'm not one of them." 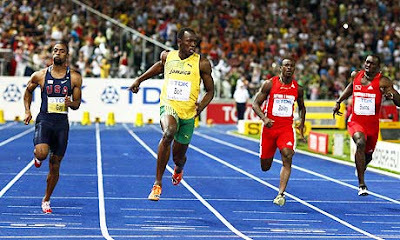 Before the final, Bolt had made prescient reference to Owens' deeds in the last century. "Jesse made history here, so I'm going to try to do the same," he said. While the social and political environments in which the two men raced are unrecognisable, as are the substances under their feet - cinders then, blue artifical track now - there are eerie and unmistakable parallels between the pair. Both first came to the world's attention as callow teenagers at school. Owens equalled the world record for the 100-yard dash while still a student at East Technical High in Cleveland; Bolt won the 200m at the world junior championships as a 15-year-old boy. Both were 21 years of age when they began to destroy the record books. 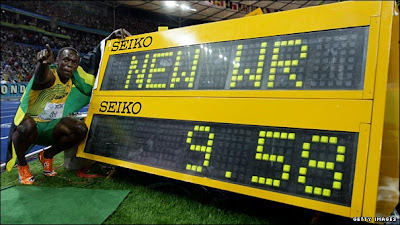 Owens, famously, set three world records and equalled another in a period of just 45 minutes at the Big Ten meet in Michigan; Bolt blew apart both 100m and 200m world records in five unforgettable days in Beijing. Both then went on, at the identical age of 22, to astonish the world on a warm August day in Berlin. Hell, there are even spooky similarities when it comes to their spikes. In 1936, Owens was visited before his final by a German named Adi Dassler, who persuaded him to wear a pair of shoes made by his company Adidas. It was the first endorsement deal an Afro-American athlete had ever been offered. Fast forward through the years and Bolt has the most lucrative shoe deal ever seen in athletics. The suppliers? Puma, the company founded by Adi's brother Rudi, partly as a result of the money generated by Owens' deeds. When Bolt was driven out of the Olympiastadion on Sunday night, hundreds of fans sprinting after his exhaust fumes, it was down a road re-named Jesse-Owens-Allee. It might be time to build another alongside it. Usain Strasse, or maybe Bolt Boulevard. And there will be no speed limit.